A prominent Non Governmental organisation- HUMAN RIGHTS WRITERS ASSOCIATION OF NIGERIA (HURIWA) has accused President Muhammadu Buhari of attempting to foist a totalitarian regime through a subterfuge by the eleventh hour plot to arraign the Chief Justice of Nigeria Walter Samuel Nkanu Onnoghen before the code of conduct Tribunal over sundry allegations bordering on non declaration of assets. HURIWA is of the considered opinion that mischief and malice may have guided the decision of the Presidency to institute these charges before a tribunal tailor -guided by the executive arm of government going by the fact that the Code of Conduct Tribunal and Code of Conduct Bureau are controlled by the Secretary to tbe governmemt of the Federation. HURIWA wondered why the Executive Arm of government did not approach the regular court system or the National Assembly if these charges aren't politically motivated blackmail to whittle down the influence of a Southern born Chief justice of Nigeria in the event that the Presidential election becomes stalemated and may require adadjudication before the Supreme Court of Nigeria. HURIWA recalled that the President hesitated in appointing the current Chief Justice of Nigeria in a substantive way but plotted to impose a Northern born justice who was then second in line in terms of seniority to the current holder of the office of CJN. The Rights group said there was no way the Chief justice of Nigeria will get justice from the hand picked Code of Conduct Tribunal appointed and reorganised structurally by Presidency shortly after the Chairman of the Tribunal aquitted the Senate President Dr Bukola Saraki of all charges of failure to devlare his assets and the CJN headed the appelate panel that finally nailed the coffin of the Presidency's plot to sustain a case against the main political rival of the current President in the person of the Senate President. “These politically motivated war against the CJN is a pay back for his principled stand to disharge and aquit Saraki of all charges as framed up by the Executive through the Federal Attorney General. Moreover, HURIWA faulted the call by the Presidency on the CJN to quit based on those charges that are still within the realm of suspicions and have not been so determined by the Competent Court of law. “Going by Section 36(5) Onnoghen is totally innocent in the eye of the law and can't be removed from office based on mere allegations. Buhari must adhere to the principle of rule of law and restrain himself from imposing a fait accompli on the executive conted Conduct Trubunal”. 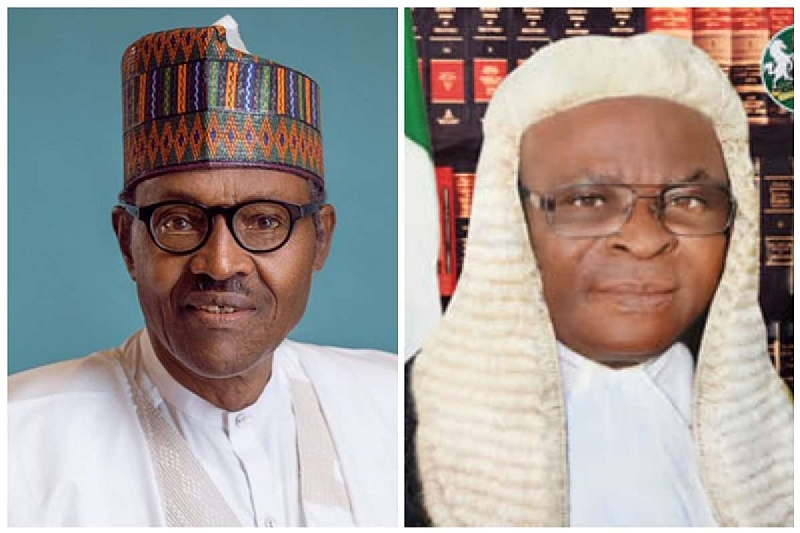 HURIWA recalled that Buhari declared political war on the Chief Justice of Nigeria (CJN) Justice Walter Samuel Nkanu Onnoghen, by asking him to immediately vacate his exalted office as Head of the Nation’s judiciary over alleged sundry asset declaration issues. In a move to force Justice Onnoghen out of office, the Federal Government will on Monday January 14, 2019 arraigned the CJN before the Justice Danladi Yakubu led- Code of Conduct Tribunal (CCT) in Abuja on charges of failures to declare his assets as required by law and for operating Bank Domiciliary Foreign Currency Accounts. The charge sighted by PRNigeria against Justice Onnoghen has already being filed and served on him last Friday at his official residence in Abuja preparatory for his appearance at the tribunal. Justice Onnoghen whose appointment suffered unprecedented delay by President Muhammadu Buhari over undisclosed issues may be the first CJN in Nigeria to be arraigned for criminal charges by the Federal Government. Apart from putting the Chief Justice in the dock on Monday, PRNigeria learned that motion on notice is to be filed against him praying the tribunal to order him to vacate office and recuse himself office so as to prevent alleged interference in his arraignment and trial. A Senior Advocate of Nigeria(SAN) name withheld has been engaged by Federal Government to lead the onslaught against justice Onnoghen, while PRNigeria could not ascertain names of those who will lead the defence team for CJN. However, it is gathered that eminent lawyers have volunteered to put their services at the disposal of Justice Onnoghen in the bid to rescue him from the claws of the government. It would be recalled the President of the Senate of Nigeria, Dr. Bukola Saraki was in 2015 shortly after he emerged the Head of the Legislature, arraigned at the tribunal but the charges against him were quashed and he was discharged and acquitted by the tribunal on the ground that the charges against him by government were based on hearsay that could not stand in the face of the law.